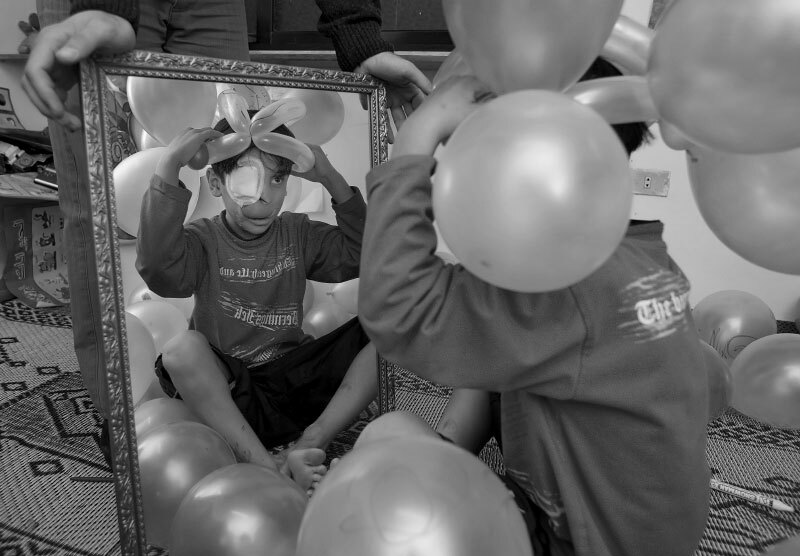 Abdullah, 7, is playing with balloons in a children’s room created in a local hotel where the patients spend time to recover. The day after his grandfather was shot to death, Abdullah, then 6, stood with his father at the funeral tent in Baghdad. After a bomb exploded at a market down the street, neighbors began rushing toward the scene. Then the second attack came to them near the tent they were standing by. For three days, relatives looked for Abdullah in Baghdad’s hospitals until they found him in a hospital where he had been driven by a neighbor. During that time, his father was recovering at another hospital of his own injuries begging his brothers for news of Abdullah. In December 2006, Abdullah flew to Jordan, escorted by an uncle. His father soon followed, in part to seek treatment himself. He has lost his left foot, he face was crashed and lost his left eye, and has gone through 6 surgeries so far.